Denmark, 1950s This unusual Danish modern table places an irregularly shaped teak top on a three-legged base of carved and limed oak. It would work equally well behind a sofa or freestanding. Denmark, 1960s This teak bookcase exemplifies the solid simplicity of line typical of its Danish designer Børge Mogensen. It is constructed in two pieces, each with an adjustable shelf. A companion secretary is available. Denmark, 1960s This unique sofa was designed by Arne Vodder. It features a teak base and legs and a large bank seat with sculptural arms. The sofa has been newly reupholstered in Maharam wool textile. Denmark, 1960s This sideboard is constructed of teak and features two cabinet storage sections with adjustable shelving and four felt-lined drawers. [SOLD] Teak Sideboard by A. H. McIntosh & Co.
Denmark, 1960s This extra long coffee table features a unique asymmetrical shape and a partial lip around the perimeter. Denmark, 1960s This teak desk by Svend Madsen features six drawers, an open bookshelf, and unique curvilinear details. Denmark, 1960s This dresser was designed by Borge Mogensen for Soborg Mobler. It is constructed of teak and features eight spacious drawers with unique teak drawer pulls. Denmark, 1950s This teak dining set by Hans Wegner is both beautiful and functional. Two 19.5″ extension leaves slide under the table top when not in use. The chairs measure 20 in. W x 15 in. D x 32.5 in. 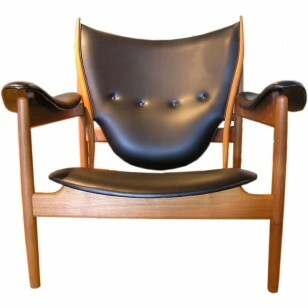 Denmark, 1950s This pair of armchairs was designed by Finn Juhl and manufactured by France & Daverkosen. 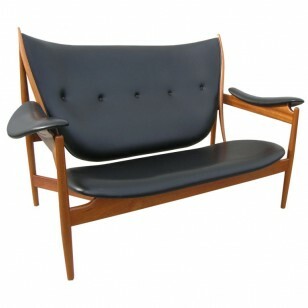 They feature a teak frame with elegantly curved arms and foam cushion seats. Denmark, 1960s This Finn Juhl credenza, constructed of teak with aluminum accents, features a floating case with three drawers and two enclosed shelving areas. Denmark, 1950s This rare coffee table by Johannes Andersen has a unique sculptural shape with a functional lower shelf. This elegant easy chair has been expertly reupholstered in grey Maharam Hallingdal textile. Denmark, 1960s These charming dining chairs by Kai Kristiansen are constructed of teak frames, which feature a unique “Z” construction, and upholstered seats and backs. The backs of these chairs swivel slightly. Denmark, 1960s This handsome teak desk, designed by Finn Juhl in the 1960s, stands on canted teak and aluminum legs. The suspended case features a shallow drawer and a filing cabinet, each with striking aluminum bow-tie pulls. Denmark, 1960s This teak desk by Arne Vodder is set on unique legs and features six drawers and a large shelf. The locks are in working order and the keys are included. Denmark, 1960′s Pair of teak nightstands, each with one adjustable shelf. Unique handles offset their rectilinear form. Denmark, 1950′s This beautiful teak desk features six drawers on one side and ample storage, both open and closed, on the other side. 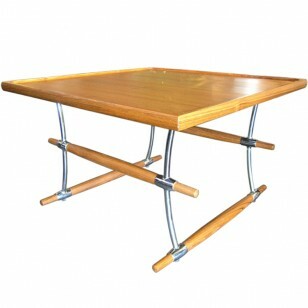 Denmark, 1950′s Three teak tables nest neatly together. Signed on underside with branded mark. 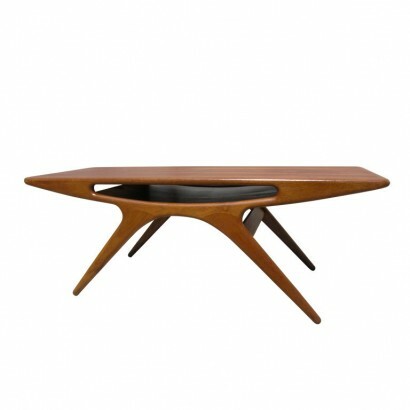 Denmark, 1957 Unique sculptural teak coffee table by Johannes Andersen for CFC Silkeborg. Denmark, 1960s This set of six dining chairs are upholstered in the original striped textile. Denmark, 1960′s Large Danish teak coffee table, expertly refinished with the original manufacturer’s stamp on the underside. Denmark, 1950′s Designed in 1950, these lovely easy chairs are simply but beautifully constructed of oiled oak and paper cord. Denmark, 1980′s This unique round teak wall mirror features two semi-circle doors that can be opened as a tri-fold mirror or left closed for a sculptural wood wall-hanging. Denmark, 1960′s This elegant teak sideboard features beautiful woven sliding doors with pullout shelves in each of the three sections. Denmark, 1950′s This set of six classic dining chairs by Hans Wegner features classic joinery which adds beautiful detail. The paper cord on all six chairs is in very good condition. Denmark, 1950′s Rare set of ten dining chairs by Arne Hovmand Olson. Denmark, 1950′s This seat on this elegant folding stool has been expertly replaced with high quality leather. Denmark, 1950′s This beautiful teak desk features six spacious drawers on one side and open and closed storage on the other side. Denmark, 1960′s The clean simple lines of this executive desk highlight the function of the piece. With six large drawers on one side and open shelving on the other. 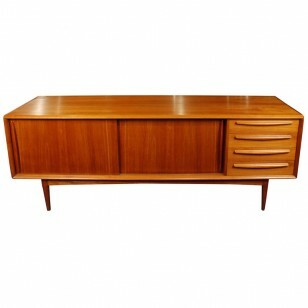 Denmark, 1960′s This beautiful teak sideboard has two sliding doors which open to reveal roomy shelving. Excellent craftsmanship and details make this piece a focal point in any setting. Denmark, 1950′s These sweet side tables have beautiful ceramic tile tops. Denmark, 1957 This beautiful coffee table has a suspended lower shelf made of rattan. 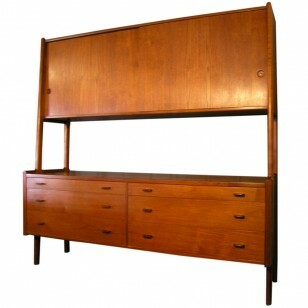 Denmark, 1950′s This compact teak sideboard cabinet by Borge Mogensen has adjustable sliding shelves and drawers. Both sides lock with included key. 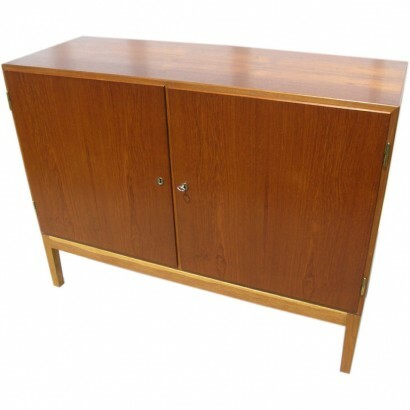 Denmark, 1960s This beautifully detailed Danish modern sideboard boasts exceptional craftsmanship. On the right side, sliding doors reveal small drawers and shelves, and on the left the four large drawers offer plentiful storage. 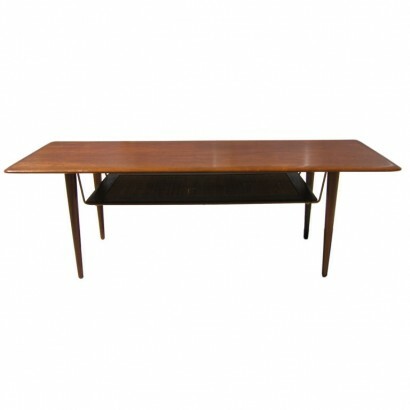 Denmark, 1950′s This coffee table features a unique stainless steel and teak construction that is Quistgaard’s signature style.